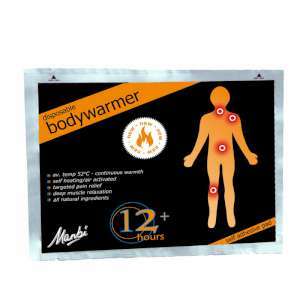 The Manbi Bodywarmers are perfect for a cold day, providing 12+ hours of continuous warmth. The Manbi Bodywarmers are made from all natural ingredients, are best used insulated within a pocket or a under a layer of clothing and are self adhesive. The Manbi Bodywarmers can also easing aches caused by muscle and joint pains; for soothing tummy ache and for keeping warm when you are skiing, snowboarding, camping, hiking or participating in outdoor activities.